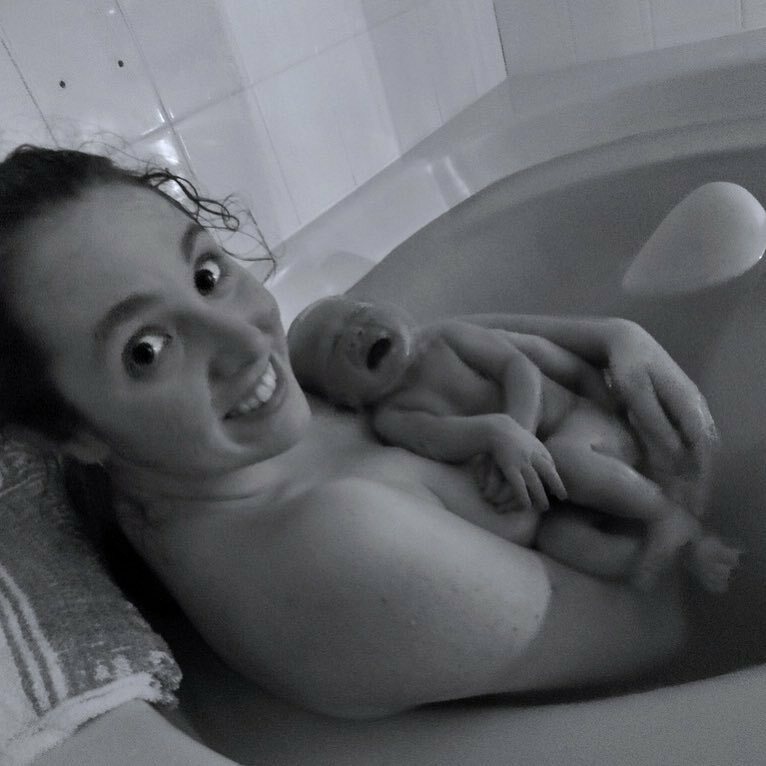 A natural, water birth for my first son. When I was pregnant I sought out so many birth stories – both written and filmed. Not only were they informative they also helped me visualise how I wanted my labour and birth. But I’ve been debating whether or not I wanted to share my story online. It was such a sacred and personal day but I know sharing it want detract anything from our special day. I also think we need to normalise positive birth stories. Giving birth is a beautiful, empowering, expansive and transformative experience. No matter how women plan to and end up giving birth, no pregnant woman should go into labour feeling scared or unsure of her body’s capabilities. Towards the end of my pregnancy I had Braxton Hicks contractions every day. They were never painful but I could tell something was going on. By my 38th week I started to have the occasional painful contraction. Every one sent a surge of excitement through my body. Would this be it? Is today the day? But no, they stayed very irregular and never quite intensified. The Friday before my due date (I was due on Monday 30 May) this started to change. The contractions, while still irregular, were happening more frequently. They were also increasingly painful. I had a few while eating dinner and had to stop eating as I waited for each contraction to pass. I went to bed that night excited that it might be the last night before I became a mum. As I laid in bed having occasional contractions I imagined myself in the centre of a circle. A circle of women, holding hands and holding space for me. I felt like I had the support of every mother around the world. In those moments, I knew that I was headed towards something my body is made to do. I didn’t feel scared at all. I was ready for whatever was ahead for me. I knew my body would be capable and would guide me through it all. Come Saturday morning I was pretty uncomfortable. The contractions were regular and I lost my mucus plug. By 1pm I was ready to go to the hospital. We packed up the car and headed out. The drive which usually takes 10 minutes took nearly 30 minutes due to a local food and wine festival. It was not fun and I felt every single bump. At the hospital they hooked me up to a couple of monitors. These were to time the contractions and find out how I was progressing. After 30 minutes I found out that I was only 1 centimetre dilated. They gave me some painkillers and a mild sleeping pill, then sent me home. It was quite a demoralising start and we headed back into the dreaded car again. Once we were back at home I tried to sleep and even with the sleeping pill only managed a fitful hour. The contractions continued to intensify. The mild back pain I had been experiencing earlier was now a constant source of pain. I tried to sleep on the couch (so my partner could have undisturbed sleep because I wanted him to be well rested for when it was finally go time) but was unable to drift off at all. We headed back to the hospital at 1.30am on Sunday morning. This car ride while quicker than our earlier one was nearly unbearable. Every bump sent pain through my body and I needed to keep my eyes closed and focus on taking one breath at a time. I slowly shuffled from the car park to the maternity ward. Stopping and leaning on Luke with each contraction. After a repeat of the tests I was told that I was 3cm dilated. Things were progressing but they were doing so very slowly. The midwife gave me the choice of staying at the hospital or heading home. In my birth plan I had wanted to labour at home for as long as possible but there was no way I was getting back in the car, especially because it would mean another two trips. They checked us in and gave us the room with a double bed (there is only one). To ease my back pain I chose to have sterile water injections. Sterile water injections are exactly what they sound like, sterile water injected into the small of your back. The hospital is currently running a trial to test whether two injections are as effective as four, and the number of injections is randomly assigned. I pulled the lucky straw and had four injections. Four very painful injections. The pain of these is compared to a wasp sting and lasts about 30 seconds. But the pain relief is instantaneous. The pain relief does only last two hours but during this time I was actually able to find a position that felt good and doze in between contractions. As the effects wore off and the back pain returned the sun slowly rose. Over the next three hours I moved around a lot. Partly because laying down was terribly uncomfortable and partly because I was trying to find something, anything to ease the back pain. I alternated squatting and leaning over the bed. I walked slowly to and from the toilet. I swayed. Nothing really eased the pain but I was happy enough trying. This whole time Luke had been fast asleep and I encouraged him to stay asleep. I didn’t need his assistance and each contraction forced me inwards. With each surge I needed nothing else than to close my eyes, feel it all and do my best to breathe through it. Just after 8am I hit a wall. It all felt like too much and I just wanted the back pain to end (the back pain bothered me so much more than my actual contractions). I woke Luke up and spoke to him about this urge for pain relief and we buzzed the midwife. She did an internal examination and was surprised at how far I had progressed in the last few hours. She said she expected me to be about 3.5 centimetres but I was actually at 7. In terms of pain relief she said it was too late for morphine (it takes hours to wear off and can effect babies breathing if taken too close to their birth. It was also on my list of drugs I didn’t want to take). She offered me another round of sterile water injections but I didn’t want to go through the pain of being injected again (I think that says a lot compared to the pain of labour). She said I didn’t need an epidural as I was still calm and doing so well. I’m eternally grateful that she offered me encouragement rather than an epidural. Going in to labour I knew I wanted a natural birth. I knew that I didn’t want to take any drugs for pain relief and I wanted to avoid any medical interventions. I was happy to use the gas if needed, but I didn’t want to have it too early on. During labour, as the cervix dilates to the full 10cm, every woman goes through a phase known as transitioning. Usually this occurs between 8 to 10 centimetres. The transition period is often when women feel like they can’t keep going, like it’s all too much and it’s when women wanting a natural birth often request pain relief. I think I went through this phase earlier than most and I’m so glad I was birthing at a hospital that supports natural, drug free births. At this point the midwife started filling up the spa, Luke bought me some breakfast and finally bought our hospital bags in from the car. After forcing myself to eat a piece of toast with jam and drink a glass of apple juice, the bath was finally full. Stepping into the bath and kneeling in the warm water, instant relief washed over me. The back pain wasn’t completely gone, but it felt so, so much better. It was no longer on the forefront of my mind and I could focus on bringing this baby into the world. I laboured in the tub for a couple of hours, using the gas as I dilated the final centimetre. I then had the undeniable urge to push. The pushing was probably my favourite part of labour. The contractions didn’t hurt in the same way. I felt like I was doing something and watching his head slowly crown, while undeniably a strange sight is an image I’ll never forget. It took about an hour of pushing to bring our little man earthside. My waters broke about 10 minutes before he was born. (For 2 weeks I slept on a towel just in case my waters broke during the night, but in the end my precautions weren’t needed). Yes, the ring of fire is an apt way to describe crowning. Yes, I was exhausted after his head was out and momentarily forgot that I still needed to push out the rest of his body. But at the same time my body was awash with energy and feel good hormones. And then, finally, at 12.13pm on Sunday 29 May, the moment everything had been leading to happened. My baby was placed on my chest. I finally got to see his face, his fingers, all of him. After months of dreaming, I finally had my little boy in my arms. I remember looking and smiling at Luke. We were both in awe of the little human we created and so, so in love. After letting the cord stop pulsing, Luke cut the cord and we all got out of the bath. Rory was breathing but was struggling a little bit to do so. He was nostril flaring and grunting, so rather than the immediate hour of skin to skin he was taken to the nursery and given some oxygen. He was only gone for about 20 minutes and during that time I delivered the placenta without any complications and ate lunch. That little pot of sweet apple juice was one of the best drinks I’ve ever had. The midwives bought Rory back in (by then we had settled on his name) and helped him latch for his first feed. It was a little tricky to start with, but we got there. And while the skin on skin time didn’t happen as soon as I had hoped, we did still get that hour of uninterrupted time together. Giving birth to Rory was one of the best days of my life. Not just the moment he was placed on my chest, but the whole thing. The pain, the burning, the exhaustion – none of it ruined the day. Giving birth is an experience like no other. Throughout my labour I turned inwards and let my body and intuition guide me through it. I felt so connected to my body, to my breath and to my baby. I spent one night in the hospital only and unfortunately partners aren’t able to stay, so for the first night it was just Rory and me. I barely slept because I couldn’t stop staring at his face. When I did try and sleep, I needed to check on him with every little noise he made. The mum worry starts straight away and I needed to make sure he was ok. (Even though he always was). As I sat awake in my hospital bed, there were so many things I was thankful for. I knew I was lucky to have everything on my birth plan happen and that I had a happy and healthy baby, but there was so much more to be thankful for. I was in awe of my body (and will write more about this soon). It’s pretty incredible that my body can grow and birth a baby and bounce back so quickly. I didn’t have any tears, stitches or other complications, so I felt almost normal again a few hours after the birth. I’m so thankful for Luke and having him there with me the entire time. Unlike the movies, there was not a single moment where I hated him for ‘doing this to me’. He was my biggest supporter. Always letting the midwives know what I wanted. Asking me if I needed anything. Keeping me hydrated. And most importantly, simply being there for me and with me. And lastly I’m so thankful for the midwives. They allowed me to have the birth I wanted. They offered so much encouragement. Anne, who was our main midwife for the last few hours of my labour, kept telling me how calm I was and letting me know I was doing so well. She gave us space to just be together while also making sure bub was doing fine throughout it all. Once I moved from the birthing room to my overnight room the midwives there were all so helpful too. Anytime I needed to feed Rory they were there to help with latching and to help me figure it out. Because they were so hands on I felt comfortable enough to go home after 24 hours, rather than staying the full 48 hours I was entitled to. I think one of the main reasons why I had such a smooth delivery is because I wasn’t scared. No matter what was happening or how much it hurt I was never overcome by fear. I knew my body could do it and did my best to trust the process. I had complete and utter faith in myself. I do also know I was lucky as people can do everything right and still not have things go according to their plan. For all the mamas, no matter how your little one entered the world, your body is amazing for doing it.